Download "Member s Name Social Security # First Middle Last. Member s Address Number Street City State Zip Code. Name and Address of Member s Physician"
4 Definition of Replacement Important Instructions 1. 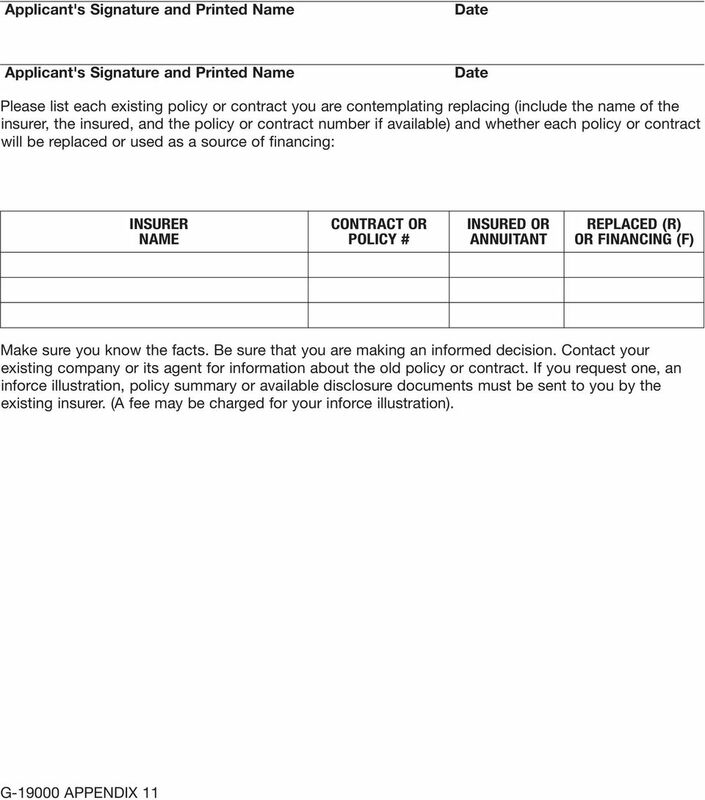 This "Definition of Replacement (Appendix 11)" form is included with your application. In accordance with the Insurance Department of the State of New York's Regulation 60, the Appendix 11 form must be completed, signed, dated and returned with your completed application even if you indicate "None" in the Existing And Pending Insurance Section on your application. 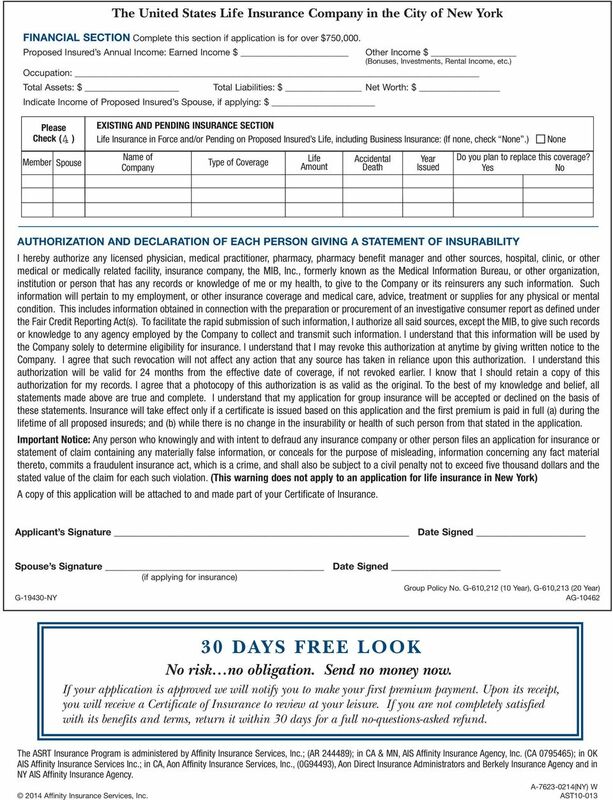 Your application for life insurance coverage cannot be processed without this completed, signed and dated form. 2. 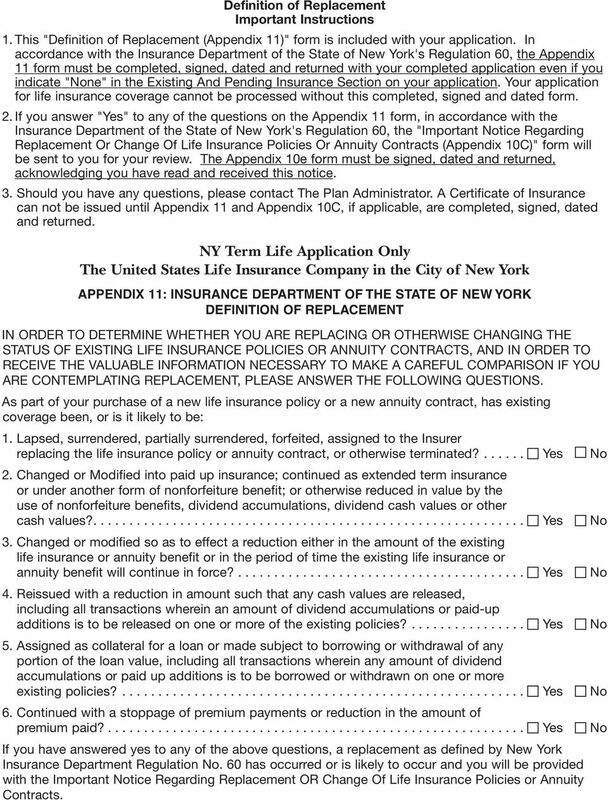 If you answer "Yes" to any of the questions on the Appendix 11 form, in accordance with the Insurance Department of the State of New York's Regulation 60, the "Important Notice Regarding Replacement Or Change Of Life Insurance Policies Or Annuity Contracts (Appendix 10C)" form will be sent to you for your review. 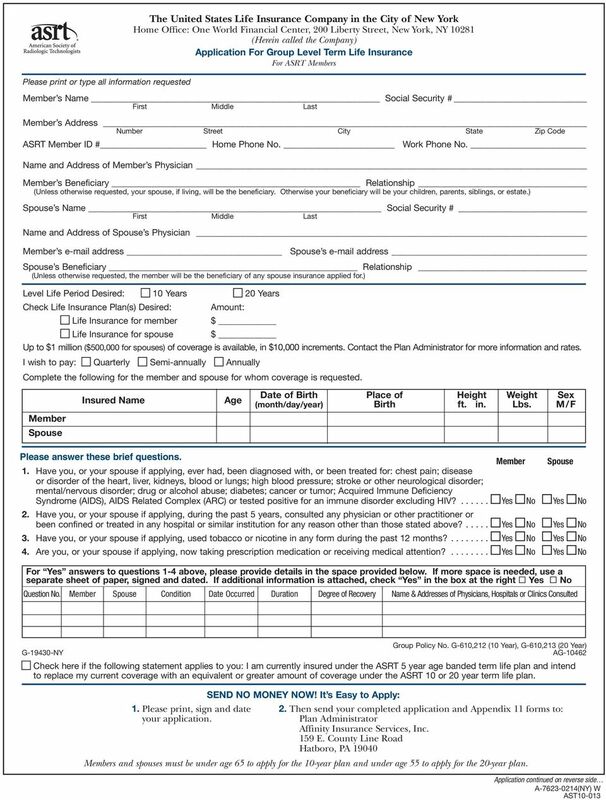 The Appendix 10e form must be signed, dated and returned, acknowledging you have read and received this notice. 3. Should you have any questions, please contact The Plan Administrator. A Certificate of Insurance can not be issued until Appendix 11 and Appendix 10C, if applicable, are completed, signed, dated and returned. NY Term Life Application Only The United States Life Insurance Company in the City of New York APPENDIX 11: INSURANCE DEPARTMENT OF THE STATE OF NEW YORK DEFINITION OF REPLACEMENT IN ORDER TO DETERMINE WHETHER YOU ARE REPLACING OR OTHERWISE CHANGING THE STATUS OF EXISTING LIFE INSURANCE POLICIES OR ANNUITY CONTRACTS, AND IN ORDER TO RECEIVE THE VALUABLE INFORMATION NECESSARY TO MAKE A CAREFUL COMPARISON IF YOU ARE CONTEMPLATING REPLACEMENT, PLEASE ANSWER THE FOLLOWING QUESTIONS. As part of your purchase of a new life insurance policy or a new annuity contract, has existing coverage been, or is it likely to be: 1. Lapsed, surrendered, partially surrendered, forfeited, assigned to the Insurer replacing the life insurance policy or annuity contract, or otherwise terminated? Yes No 2. Changed or Modified into paid up insurance; continued as extended term insurance or under another form of nonforfeiture benefit; or otherwise reduced in value by the use of nonforfeiture benefits, dividend accumulations, dividend cash values or other cash values? Yes No 3. Changed or modified so as to effect a reduction either in the amount of the existing life insurance or annuity benefit or in the period of time the existing life insurance or annuity benefit will continue in force? Yes No 4. Reissued with a reduction in amount such that any cash values are released, including all transactions wherein an amount of dividend accumulations or paid-up additions is to be released on one or more of the existing policies? Yes No 5. Assigned as collateral for a loan or made subject to borrowing or withdrawal of any portion of the loan value, including all transactions wherein any amount of dividend accumulations or paid up additions is to be borrowed or withdrawn on one or more existing policies? Yes No 6. 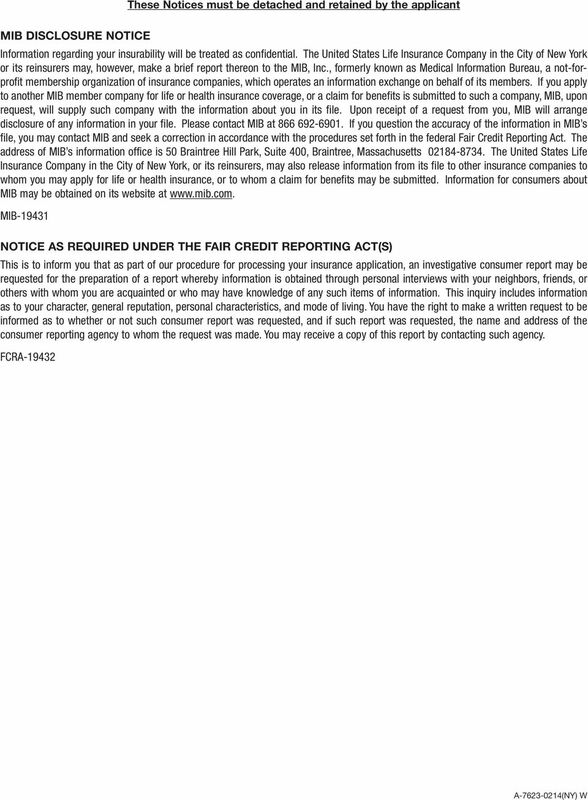 Continued with a stoppage of premium payments or reduction in the amount of premium paid? Yes No If you have answered yes to any of the above questions, a replacement as defined by New York Insurance Department Regulation No. 60 has occurred or is likely to occur and you will be provided with the Important Notice Regarding Replacement OR Change Of Life Insurance Policies or Annuity Contracts. Everyday moments are major moments. Gain peace of mind knowing they will always be protected. For Life s Major Moments GROUP 10-YEAR Level Term Life Insurance You ve been there for all of their big moments.